Share Market Today: Indian stock markets (Sensex and Nifty) finished higher on Friday with BSE Sensex closing 284 points higher and NSE Nifty 50 marking a record closing high led by the sharp rally in the shares of ITC, SBI, Yes Bank, HUL, ICICI Bank, Infosys and Kotak Mahindra Bank. Share Market Today: Indian stock markets (Sensex and Nifty) finished higher on Friday with BSE Sensex closing 284 points higher and NSE Nifty 50 marking a record closing high led by the sharp rally in the shares of ITC, SBI, Yes Bank, HUL, ICICI Bank, Infosys and Kotak Mahindra Bank. Shares of ITC were the biggest positive points contributor to the key equity indices Sensex and Nifty on Friday. Indian stocks inched up further in the late afternoon deals with BSE Sensex reclaiming 38,000 and NSE Nifty nearing its all-time high following the sustained uptick in ITC and ICICI Bank shares. In the early dealings, shares of Reliance Industries, ITC, HDFC Bank, HDFC, ICICI Bank, Infosys were the major positive points contributors to the headline indices Sensex and Nifty. Asian shares fell Thursday after deepening worries about global economic growth, particularly in China, set off a rout on Wall Street, AP said in a report. NSE Nifty 50 index closed at a record high of 11,470.75 on Friday. Shares of ITC (up 2.03% at Rs 313.7) were the biggest positive points contributor to NSE Nifty index today. Indian equity markets finished on a positive footing on Friday with BSE Sensex rallying nearly 300 points and NSE Nifty concluding at a record closing high. The benchmark Sensex ended at 37,947.88, up 284.32 points or 0.75% and the broader Nifty settled at a record closing high of 11,470.75, up 85.7 points or 0.75%. Bharat Petroleum Corp Ltd will keep a secondary unit at its 1,20,000 barrels-per-day (bpd) Mumbai refinery offline for at least two months following a fire last week, Reuters reported citing two unidentified industry sources. A BPCL spokesman could not immediately confirm the duration of the shutdown, saying that a decision will be made in one to two days, the report added. Shanghai stocks closed at a near 31-month low on Friday, dragged down by a slump in healthcare firms amid a vaccine scandal fallout, but planned talks between the United States and China helped ease trade war fears, a Reuters report said. The blue-chip CSI300 index ended 1.5% down at 3,229.62 points, while the Shanghai Composite Index closed down 1.3% at 2,668.97 points, the report added. 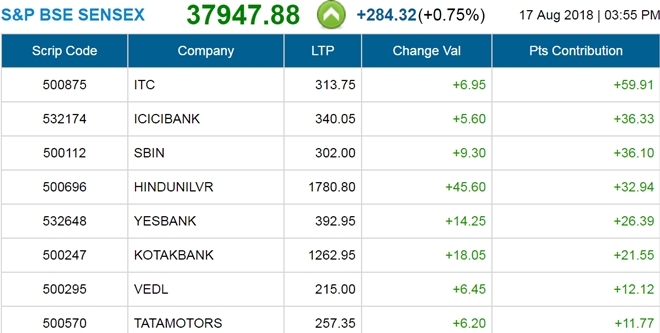 Sensex Live: The benchmark Sensex retook the psychological mark of 38,000 in the afternoon deals on Friday following the sustained upmove in the shares of industry heavyweight ITC and ICICI Bank. BSE Sensex rallied to an intraday high of 38,007.35, up 343.79 points. 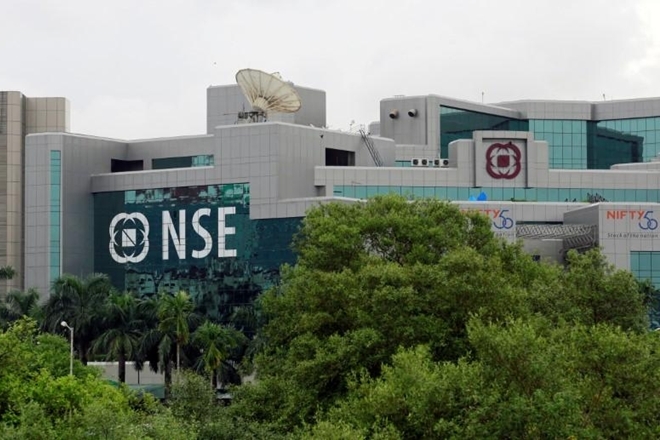 Nifty Live: Shares of Grasim (up 4.28%), Yes Bank (up 3.49%), Lupin (up 3.38%), Vedanta (up 3.18%), Tata Steel (up 2.76%), Tata Motors (up 2.51%), Titan (up 2.38%), ITC (up 2.1%), Hindalco (up 1.87%), Adani Ports (up 1.86%) were the top 10 Nifty gainers on Friday. Indian shares rose on Friday with financials and consumer staples leading the gains, while strong broader Asian peers which cheered Washington and Beijing's decision to hold trade talks next week also boosted investor sentiment, Reuters reported. Sensex was trading at 37,945.48, up 281.92 or 0.75% and Nifty was trading at 11,467.6, up 82.55 or 0.73%. The wholesale commodity markets, including bullion and metal, remained closed today in New Delhi on Friday, 17 August 2018, as a mark of respect for former prime minister Atal Bihari Vajpayee, PTI said in a report. Jet Airways on Friday informed that a meeting of the board of directors has been scheduled on27 August 2018 to consider and approve the unaudited financial results for the first quarter ended 30 June 2018. The board of directors of Jet Airways at its meeting held on August 9 deferred the matter of consideration of the unaudited financial results for the June quarter. "The meeting of the board of directors of the company shall be held on 27 August 2018, inter a/ia, to approve the unaudited financial results for the first quarter ended 30 June 2018," Jet Airways said in an exchange filing. China's yuan inched up against the US dollar on Friday after the central bank surprised markets with a slightly firmer official midpoint, but still looked set for a record 10th straight weekly loss, Reuters said in a report. With more sweeping US tariffs on Chinese goods set to kick in next Thursday and China's economy cooling, some traders believe a test of the psychologically critical 7 yuan to the dollar level is only a matter of time, the report added. Sensex Live: BSE Sensex index rallied a little more than 300 points in the mid-morning deals on Friday following the surge in shares of ITC, Reliance Industries, ICICI Bank, Kotak Mahindra Bank, HDFC Bank, Infosys. BSE Sensex rose as much as 313.48 points to hit an intraday high of 37,977.04, similarly, NSE Nifty surged to day's high at 11,477.2, up 92.15 points. The S&P BSE Sensex was trading up 280.17 or 0.74% at 37,943.73 in the late morning trades on Friday. Shares of Tata Steel, Adani Ports, ITC, Vedanta, Kotak Mahindra Bank, Sun Pharma, Tata Motors, Yes Bank, M&M, ICICI Bank, Reliance Industries, Maruti Suzuki were the top Sensex gainers on Friday rising up to 2.25%. The US dollar stepped back from 13-1/2-month highs against other major currencies on Friday as talks next week between China and the United States offered some hope that the world's two largest economies will find a way to head off a full-blown trade war, a Reuters report said. The dollar index, a measure of the greenback's strength against a basket of six major peers, was 0.1% lower at 96.549, it added. As at 9:40 am, as many as 1,215 stocks were trading in green while only 330 were hovering in red. The blue-chip shares of companies such as Axis Bank, ITC and Sun Pharma hit their respective 52-week highs in the early session on Friday. Forex and money markets are closed on Friday on account of 'Parsi New Year', PTI reported. Shares of Anil Dhirubhai Ambani Group's Reliance Naval and Engineering Ltd cracked about 4.95% in the opening deals to a day's bottom of Rs 16.31 on BSE today. The stock of Reliance Naval recovered all the losses within minutes and was trading at Rs 17.70, up 3.15%. Sensex Live: The benchmark Sensex index started up 235 points on Friday with all the stocks beginning in green. Shares of Vedanta (up 1.89%), M&M (up 1.35%), Tata Motors DVR (up 1.34%), Power Grid (up 1.33%), Yes Bank (up 1.29%) and Hero MotoCorp (up 1.18%). BSE Sensex surged as much as 262.91 points to a day's top of 37,926.47 after opening at 37898.6. Indian currency and debt markets are closed on Friday for a local holiday and trading would resume on Monday, but the local stock markets will be functioning as normal, Reuters said in a report. On Thursday, the benchmark 10-year bond yield ended at 7.86%, up 4 basis points from its Tuesday's close, it added. Earlier yesterday, the rupee today slid 26 paise to close below the 70-mark for the first time against the US currency, hammered by strong dollar demand amid growing concerns over widening trade deficit, a PTI report said. The rupee collapsed to a historic intra-day trading low of 70.40 before closing at a fresh lifetime low of 70.15 per dollar, down by 26 paise or 0.37% over the previous close, the report said further. The early indicator of NSE Nifty, SGX Nifty Futures was trading down 0.03% at 11,421.5 on the Singapore Exchange on Friday. The gauge has shuttled between a range of 11,444 and 11,403. Earlier yesterday, US stocks rebounded with the Dow posting its biggest percentage gain in over four months, as positive earnings and waning trade jitters buoyed investor confidence, a Reuters report said. The Dow Jones Industrial Average rose 396.32 points, or 1.58% to 25,558.73, the S&P 500 gained 22.32 points, or 0.79% to 2,840.69 and the Nasdaq Composite added 32.41 points, or 0.42% to 7,806.52.